Priceless moments in a child’s development are fleeting and once they’re gone, they’re gone forever. The best way to remember these cherished moments is through photographs and video, and modern technology makes this easier than ever before. Children grow and change on a daily basis and it is true what people say – children grow up so fast. New parents lead busy lives, of course, and may struggle to find the time and energy to take photographs in between changing nappies, washing bibs and waking up in the middle of the night to feed their child. That is certainly understandable, but it is worth remembering that parents will never regret having too many photographs of their children. It’s the parents without enough family snaps who will feel sorry for themselves. With mum working, it will be left to the stay-at-home dad to take on the role of David Bailey, but modern equipment means very few skills are required. First of all, dads should invest in a digital camera. Good quality cameras are relatively cheap these days and a digital one will allow dads to snap away without wasting film. Look the subject in the eye. Stoop to the child’s level to capture magnetic gazes and mesmerizing smiles, as direct eye contact can be as engaging in a photograph as it is in real life. Use a plain background to show off the subject. Study the area surrounding the subject when taking a photograph and make sure there is not a lot of confusing clutter. Use flash outdoors to prevent a bright sun causing unattractive shadows on the subject’s face. Flash will brighten up the child’s face. Move in close to a subject and zoom in so that the picture area is filled by the subject. Don't get too close, though, or the photographs will be blurry. Don’t be afraid to move the subject away from the centre of the photograph. Centre stage is the best place for the subject most of the time, but sometimes moving the subject away from the middle of the photograph can bring a picture to life. Some subjects look better in a vertical photograph, so remember to turn the camera sideways and take some vertical shots. Try to take control of the subject – although not always easy with children – and direct the action to get better results. Variety is important, so take candid photographs to show the child at playing learning or interacting with others. Use overhanging tree branches, an arch or a doorway to frame the subject and give a photograph depth. 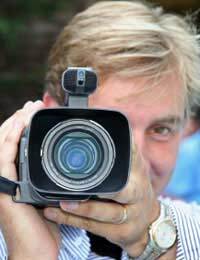 Many of the same rules apply when using a video camera, and a lot of digital cameras – and even mobile telephones – now offer the option to record video. Whether using a digital video camera or a film one, it is easy and cheap to transfer the footage to a DVD and share it with the family. Images and video clips can even be transferred to a computer and safely shared over the internet, which is an ideal option when grandparents live far away.